Arrangement for voice and piano of the aria "Libiamo ne'lieti calici" (Drinking Song) from the opera "La Traviata" written by Giuseppe Verdi. 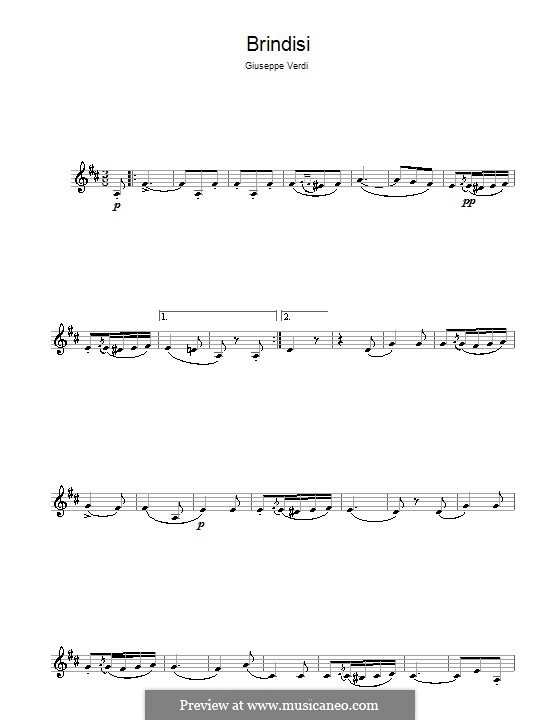 This is a set of parts to Yoon Jae Lee's arrangement of the famous drinking chorus from Verdi's celebrated opera La Traviata is now available for string quartet. This arrangement is suitable for weddings, parties, and even encores. NOTE: There is one less bar (measure) between mm. 98 and 99 in this arrangement than is normally heard. The extra bar was deleted by Verdi himself and this is confirmed in the autograph score. 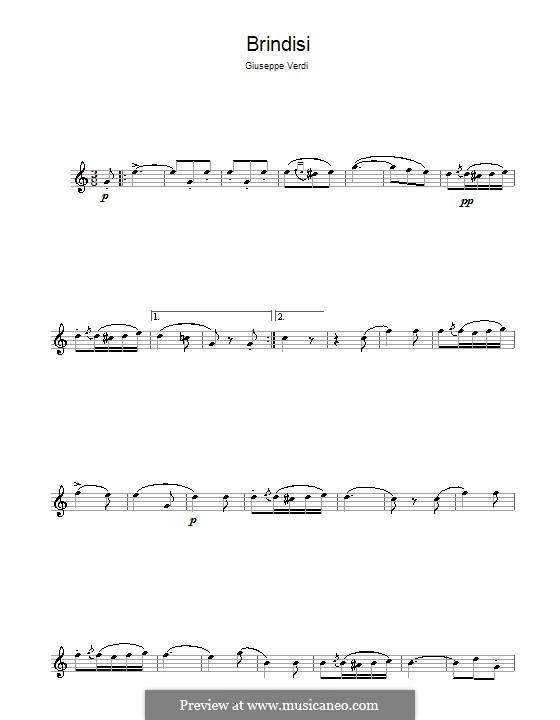 It is highly recommended that this arrangement be played as written so as to conform with the composer's intentions. As part of my "Famous composers" series, this famous aria from La Traviata translates very well onto brass. I suppose there's an affinity between brass players and drinking songs! This is certainly a rousing example. The melody is shared between the 1st Trumpet, Horn and Trombone/Euphonium (Parts 1,3 and 5) as the different singers take their 'verse'. It is great fun to play with lots of excuses for horseplay amongst the players. Part 4 in C/Bb - Trom./Euph./Barit. The pdf includes an extra part 4 in bass clef, without the change to tenor clef. 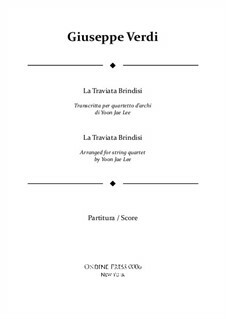 9Siblingz presents to you the duet "Brindisi" from Verdi's opera La Traviata. 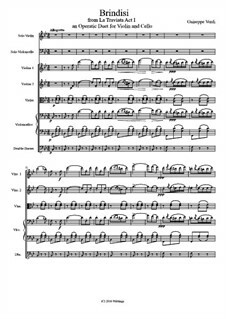 Arranged for solo violin, solo cello and string orchestra. 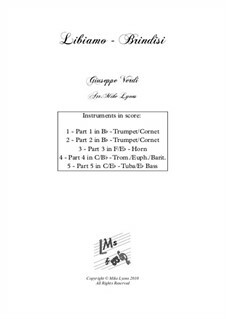 Contains conductor's score and parts. 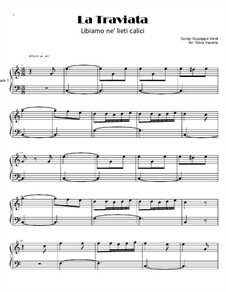 This arrangement is relatively easy (grades 4-5). 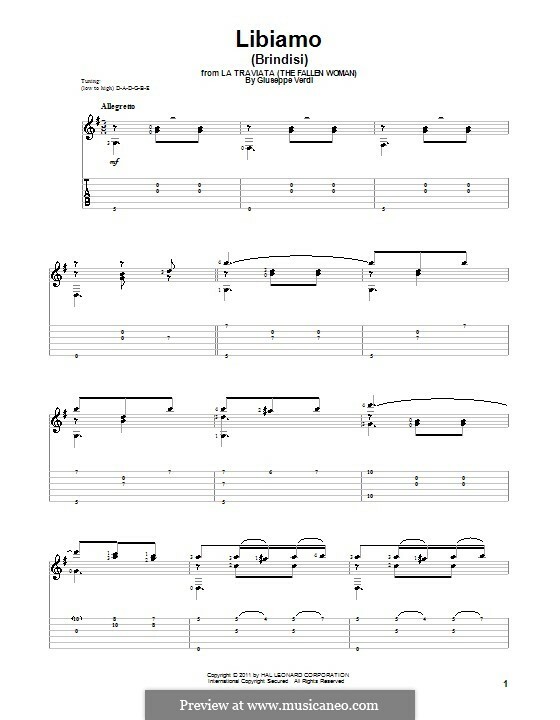 This is an easy version for beginenners in C Major of the famous opera La Traviata. Listen to the file and have a look at the preview! 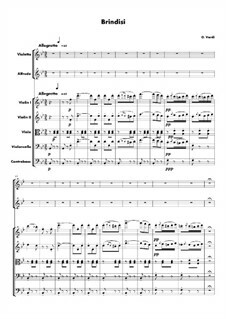 The famous drinking chorus from Verdi's celebrated opera La Traviata is now available for string quartet. This arrangement is suitable for weddings, parties, and even encores. 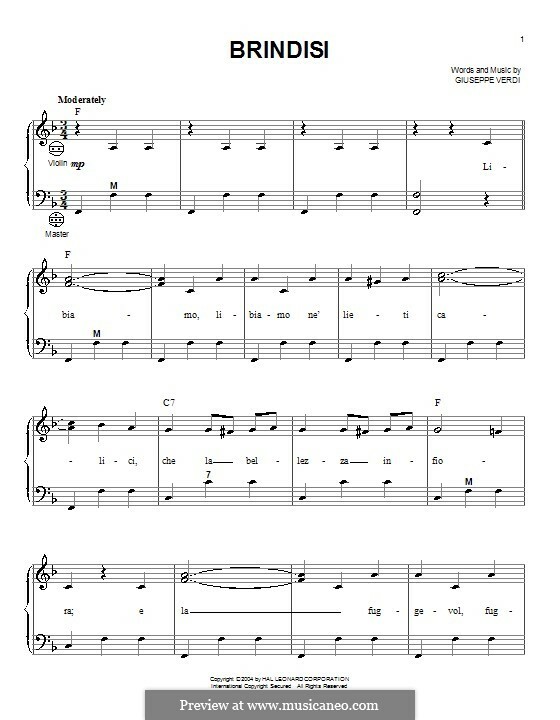 For soloists, choir and piano Arranged by Tours B. 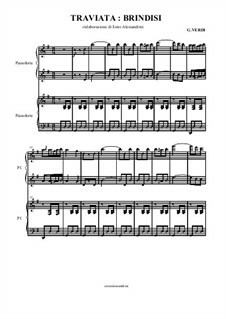 For voice and piano (Italian text) Arranged by Tours B. For string trio Arranged by Zubkovsky I. 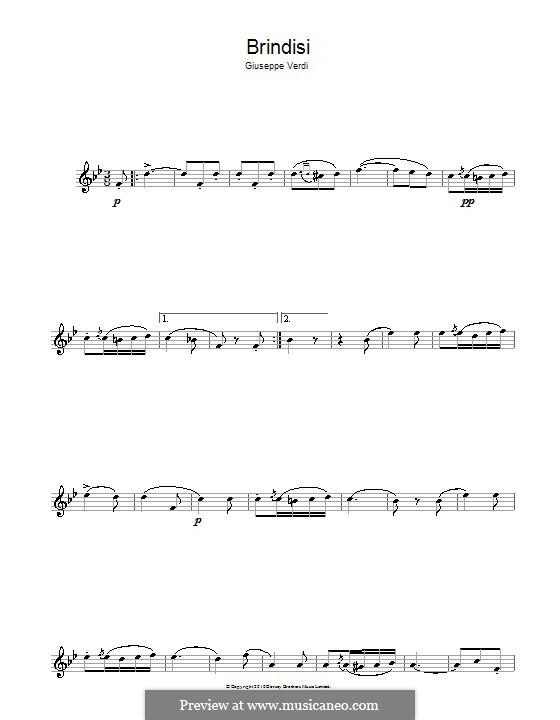 For string quartet – set of parts Arranged by Lee Y.J. 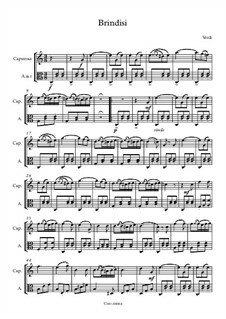 For piano Arranged by Billema R.
For violin and viola Arranged by Smolina N.
For piano four hands Arranged by Alessandrini E.
For piano Arranged by Vazzola S.
For string quartet – full score Arranged by Lee Y.J.